I think most brides will agree, that one of their 'must have' wedding photos, should they write such a list, would include a stunning photo of their wedding dress on the morning of their wedding. I was commissioned to photograph a wedding at Gosfield Hall in Essex, and the venue is blessed with an enormous bridal suite - And when I say enormous, I really do mean it; the one room is bigger than my entire house! Aside from the massive proportions, it's beautifully decorated with rich and warm colours, as you can see with this ornate door. Abbie's wedding dress was vintage and made from lace. 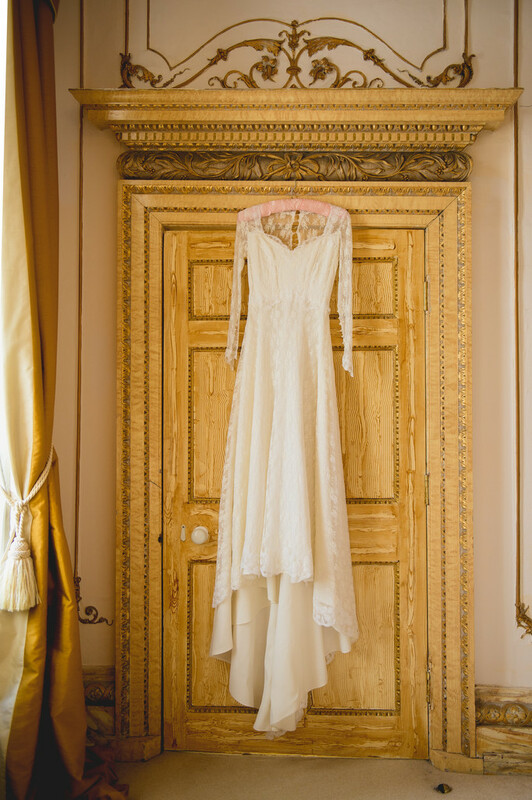 The best way to present the wedding dress for a stunning photo was to hang it in front of this door. The colour of the door is perfect for setting off the wedding dress, and the warm light flooding into the room through the many windows fell softly on the dress, not overpowering the subtle details at all. Specialist wedding venues usually have coat hooks hung abnormally high on the walls of the bridal suite, and this serves one very important purpose - allowing the wedding dress to be hung in such a way that it naturally cascades down, removing any creases from storage and allowing everyone to see it in all it's glory.